Author Don Berliner claims that, "[The Owl Racer] is the easiest racer to model for RC pylon." Curiously, given that claim, no plans were published for it, but there are 3-views. Designer George Owl (I kid you not) applied knowledge gained from the School of Hard Knocks in the field of airplane racing on top of his ample experience with "brains-and-slide-rule" design to create this winning craft. Did you catch that? "Brains-and-slide-rule." Unique because of new ideas, the Pogo proved it has winning potential in its first two races. Smooth lines make it suitable for any model project. The owl is a pussycat. And a tiger. And a 'possum. A pussycat, because Bud Pedigo, first pilot to race this new Formula One, says he'd turn a student loose in it. A tiger, because it blasted around the three-mile oval at St. Louis at 209 mph its first time out. A 'possum, because it's now named Pogo, who is one of the better-known 'possums of the Okeefenokee Swamp. Only engine performance information really matters in any racer. 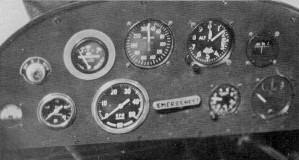 Pogo is not flown cross-country to the meets, so minimum instruments are used. Designer theorized that less wetted area and fewer cowl intersections offer less drag than the typical tight-fitting cheek cowl. This is the easiest racer to model for RC pylon. 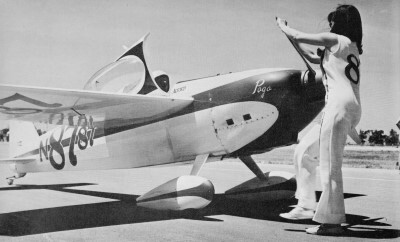 Pogo's color scheme is metallic olive green striping and numerals on solid white, with a black antiglare panel in front of the cockpit. The tail wheel is tiny. And the Owl Racer because it was designed by George Owl, who has been involved in the brains-and-slide-rule part of airplanes ranging all the way from Midget Monocoupe to X-15. Engineers, as a general rule, don't make very good raceplane designers, for they tend to build airplanes that are too big and too heavy. But an engineer with racing experience is another matter, and that is the exclusive category into which George Owl fits quite snugly. He got into the raceplane racket in 1947, when the Goodyear Racers flashed onto the scene and it seemed as though just about everybody was starting to build one - or at least was talking about building one. George was no exception, but his airplane was. It was the one and only high-wing ever proposed for the 190 cu. in. class. He built it for Woody Edmundson, then a rather successful pilot of racing­P-51's and aerobatic Monocoupes, and now a very successful charter flying operator. The racer was called the Midget Monocoupe, and looked like one, with a Monocoupe's classic tapered wing atop a very small fuselage. It was ready in 1948, but Woody found it entirely too hot to handle, so it never got to Cleveland, although Woody and his other airplanes did. The Midget Monocoupe drifted around for years, finally becoming the property of an EAA type in Miami, name of Henry Watts, who improved its flying characteristics and entered it in the 1969 Florida National Air Races. Everyone was impressed by its sporty looks, but the officials frowned on its wobbly flight path and ordered it to stay on the ground, where it will probably remain, at least when other planes are racing. Owl had long since moved on to bigger and better things, changing jobs from Aeronca to McDonnell and then developing possibly the most radical racer in history-the P.A.R. Special. This slick little craft boasted an engine buried behind the pilot and driving, by means of a six-foot extension shaft, a Fairey pusher prop "mounted aft of the Y-tail. As if that weren't enough, it also had a variable-incidence wing. But no amount of fine engineering, workmanship and piloting could overcome the drawbacks of the long shaft, which distorted during high-g turns, and so it was retired after achieving a best performance of 181 mph at Chattanooga in 1952. His radical ideas having brought no success, George Owl vanished from the racing scene and busied himself at North American Aviation, designing such run-of-the-mill flying machines as the B-70 and X15, neither of which made so much as a ripple in the air racing pond, although they reportedly were fairly fast. 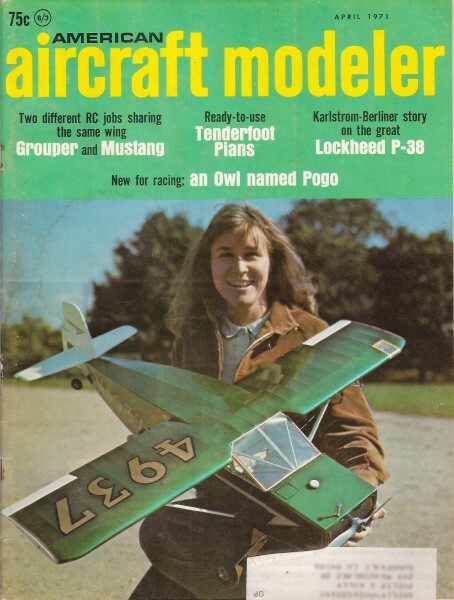 Shortly after air racing returned in 1964, so did George Owl, this time well armed with ideas, vastly more experience, and an expert builder named John Alford. Together, they developed the Owl Racer. Hardly anyone knew of its existence until, as if by magic, it appeared on the ramp in front of the race hanger at St. Louis in August, 1969. The machine was beautiful, no doubt about it. Its lines were smooth and artistic. Its construction and finish were the equal of any racer in the country. But it looked a bit on the large size, especially in the front end. Polite questions about the reasons for the bulky cowl brought a painstaking explanation from its designer. And while it was obvious that a lot of racing veterans were far from convinced by the explanation, none of them was equipped to argue aerodynamics with a guy like George Owl. The other half of the team was John Alford, an air tanker pilot flying Grumman F7F Tigercats. A qualified mechanic as well as pilot, John had converted Stearman trainers to dusters, restored Beech Staggerwings, and flown B-17s in forest fire operations. In addition to an outstanding job of construction, John will soon make a further contribution to the story of #87. His wife, Joan, will be its pilot for 1971, and thus the first woman to compete in Formula One. A lot of brand new racers are exceedingly fast on the drawing board, in the workshop and at the home field. And a lot of pretty bubbles are burst in that first spin around a race course, when the unbiased stopwatch converts dreams into reality. But this time there was nothing for the Owl crew to apologize for, as pilot Bud Pedigo clocked 208.90 mph, good for sixth place in an amazingly fast field of 13 racers. Four years of careful planning and hard work began to payoff. The Owl Racer didn't become the Cinderella plane of the year by beating Rivets. In fact, it didn't even make the Finals in its first try, being plagued by poor takeoff acceleration. Still, it topped 200 mph in the Consolation Race and put everyone on notice that more would be heard. A few weeks later, at Reno, Pedigo earned over $1000 by flying #87 into fifth place in the Formula One Championship Race at almost 204 mph. Such performance for a completely new design, while not unheard of, is certainly rare. How did Owl and Alford do it? By careful detail work, by precise alignment of every important piece, and by knowing which tried-and-true techniques to use and which to ignore when their own calculations pointed down an untried path. The main deviation from conventional design in the Owl Racer is its cowl - large, but simple. The Owl cowl, according to George, has less surface area, no sharp intersections, more interior space and a better shape for withstanding pressure. Moreover, it has a blunt front where the cooling intakes are located, to accommodate a steep angle of airflow without stalling, thus producing maximum cowl thrust, similar to wing lift. The original exhaust and cooling systems were worth note, with both exiting on the bottom of the airplane, just ahead of the firewall. 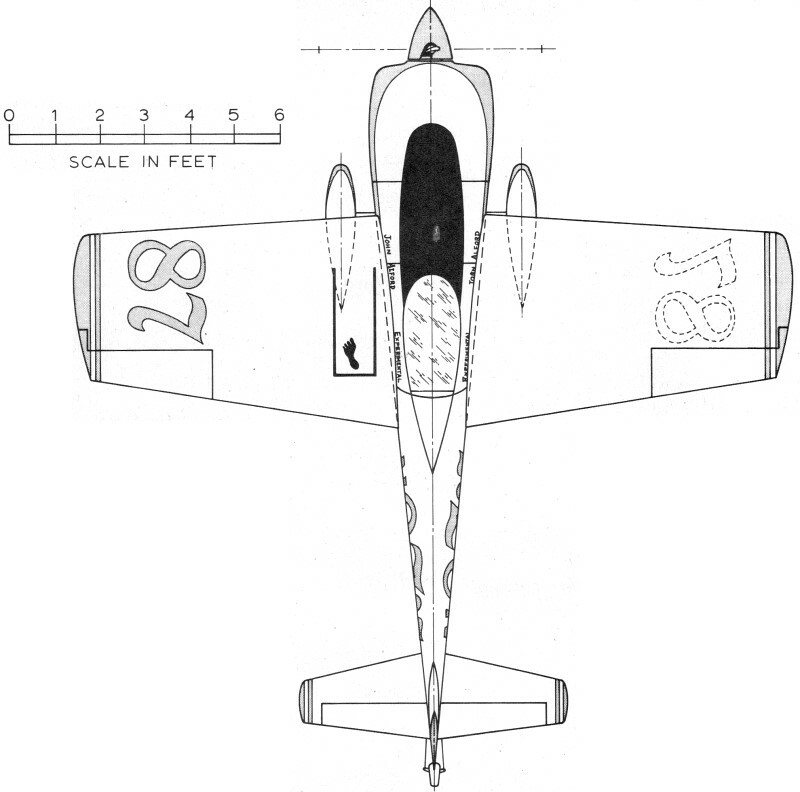 The stacks were located at either side of a cowl flap in a very clean arrangement. After the 1969 season, the exhaust system was lightened and simplified by switching to individual stacks cut off flush with, ports on either side of the cowl. Other changes, mainly aimed at reducing weight, are to include elimination of the oil radiator, replacement of the thick galvanized firewall with aluminum and asbestos, and switching from copper pitot and static lines to plastic or aluminum. Construction is straightforward. The wing has a one-piece laminated spruce main spar, half-inch thick spruce ribs and plywood covering. Aileron control is via a one-inch torque tube which can be disconnected for easy wing removal by pulling a single bolt in the cockpit without affecting aileron rigging. The fuselage is welded chrome-moly steel tubing with metal covering to the front of the cockpit and fabric aft. The tail has a spruce frame covered with plywood. The canopy is a single piece of molded Plexiglas with a composite wood/ foam/fiberglass frame and rear fairing. Power is supplied by the typical stock Continental 0-200, properly balanced and with a racing prop which enables it to turn about 3750 rpm and develop about 125 hp. One season of racing, even when it is as successful as the Owl's in 1969, still doesn't prove a design. At best, it can only indicate potential. The Owl Racer unquestionably has speed and good flying characteristics, which is about all that should be asked of a racer. Its future is bright but completely uncharted. Plans, available from John Alford (291 Beech Ave., Santa Rosa, Calif.) for $125 a set, consist of 56 individual drawings including all structure, primary controls, fuel tank and canopy, as well as full-size ribs and fairing contours. Their acceptance by builders could make the Owl Racer one of the truly significant racer designs. In the meantime, #87 will be busy trying to win races. 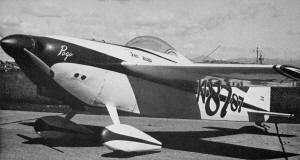 Basic airplane is white with metallic olive green striping and numbers. Black pilot name, airplane name and emblem on vertical stabilizer, wing-walk and footprint on upper surface of left wing, and cowling anti-glare panel. Area - 66 sq. ft.
Area - 8.5 sq. ft.
Area (projected to fuselage reference line) - 5.10 sq. ft.